Behaviorism is essentially the study of how we learn. Humans are different from many animals in that we possess very little instinct, or genetic blueprint for our behaviors. For example, humans do not instinctively know how to perform a ritual mating dance or we do not instinctually fly south for the winter. Instead, humans progress through life continually changing our behaviors due to new or repetitive experiences. In a word, we LEARN. It was the Greek philosopher, Aristotle who came to the conclusion, over 2000 years ago that we learn by association. Learning by association is connecting events that occur in sequences. Psychologists have determined that there are two basic types of learning by association: Classical Conditioning and Operant Conditioning. Classical Conditioning was first developed by a Russian physiologist named Ivan Pavlov during the late 1920’s. Pavlov was originally trying to study the saliva’s role in the digestive system of dogs. During the course of his experiments he made the connection between reflex and a conditioned response. Essentially, what Pavlov discovered was the model of learning that works on both animals and humans. 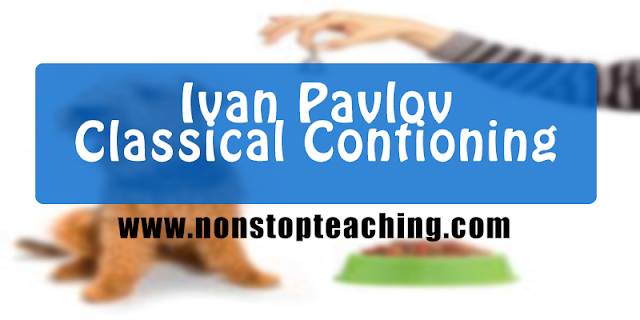 To understand classical conditioning it is best to describe Pavlov’s experiments. Pavlov realized that when a dog is introduced to a plate of food, the dog’s natural reaction or reflex was to begin to drool. Drooling was then an Unconditioned Response (UCR) to the presence of the food. The food was then the Unconditioned Stimuli (UCS). What Pavlov then stumbled upon was an association that took place when a bell was rung when the food was presented to the dog. Normally, a bell is a Neutral Stimuli (NS), which means that on its own a bell will not cause any real reaction to a dog. However, when the bell was rung in conjunction with the presenting of the food, the dog began to associate the ringing of the bell with the presence of food. After awhile, Pavlov had only to ring the bell and the dog would begin to drool. In this sense the bell became a Conditioned Stimuli (CS) and the drooling at the bell became the Conditioned Response (CR). 1. Acquisition - Is the initial learning that takes place. It is determined by how much time elapses between the presenting the neutral stimuli (NS) and the unconditioned stimuli (UCS). 2. Extinction - Is how long it takes to forget or eliminate the conditioned response (CR). 3. Spontaneous Recovery - Happens after the conditioned response (CR) reappears after a long period of time. It proved that Extinction only suppressed the conditioned response (CR), not completely eliminated it. 4. Generalization - Is the tendency to respond to stimuli that is similar to the conditioned stimuli (CS). For example Pavlov’s dog would drool upon hearing a buzzer as well as the bell. 5. Discrimination - Is the learned ability to differentiate between similar stimuli (the dog learns eventually to tell the difference between the bell and the buzzer). In the end, Pavlov was a Nobel Prize-winning physiologist who discovered classical conditioning in the course of his physiological research. He eventually and begrudgingly became a psychologist and in the process helped change the direction of psychological research. Classical conditioning became a major tool in the theoretical formulations of later behaviorists. It allowed them to explain behavior without having to consider consciousness. Pavlov's discovery of classical conditioning provided the first mechanism for explaining learning without reference to the mind. Life is a process of continual change. From infancy to adolescence to adulthood to death, we are changing. Many factors work together to produce those changes, but one of the most important is the process of learning. Through our experiences, we learn new information, new attitudes, new fears, and new skills; we also learn to understand new concepts, to solve problems in new ways, and even to develop a personality over a lifetime. And in the course of reading textbooks, we learn new definitions for words like learning: In psychology the term learning refers to any relatively permanent change in behaviour brought about through experience—that is, through interactions with the environment. We begin our study of specific types of learning with a simple form called classical conditioning. The scientific study of classical condition began around the turn of the [20th] century with an accidental discovery made in the Leningrad laboratory of Ivan Pavlov. Pavlov was a Russian physiologist who was studying the role of saliva in digestion at the time of the discovery. To study the reflexive response of the salivary glands to the presence of food in the mouth, he had surgically implanted tubes in the cheeks of dogs so that saliva could be drained and precisely measured when small amounts of food were placed in the dogs’ mouths. Pavlov noticed, however, that dogs that had been in the experiment a few days started salivating when the attendant entered the room with the food dish before the food was placed in their mouths. The sights (and probably sounds) of the attendant had come to elicit (evoke or produce) a reflexive response that only the food had originally elicited. This fact would have gone quite unnoticed had the tubes not been placed in the dogs’ cheeks—that is the accidental part of the discovery. A dog that salivates whenever he or she sees a laboratory attendant may not seem like a great step forward for science at first glance. But Pavlov recognized that a reflexive response to food, which was biologically ―wired into‖ the nervous system, had come under the control of an arbitrary stimulus—the sight of the attendant. Stated in a different way, Pavlov knew he had witnessed a form of learning that was based on nothing more that the repeated association of two stimuli. Because the dog’s experience of food was linked to the sight of the attendant, the behaviour of the dog was changed— the dog now salivated to the stimuli of the approaching attendant. That is, the stimuli elicited a response. When you were born, you could only respond to the outside world with a limited repertoire of inborn reflexes, but now you are a marvelously complex product of your learning experiences. Pavlov wanted to understand this process of learning, so over his colleagues’ objections, he hastily completed his studies of digestion and devoted the rest of his career to the study of learning. It had been noted by Aristotle more than 2,000 years before Pavlov that two sensations repeatedly experienced together will become associated. If you have frequently visited the seashore with a friend, visiting the seashore alone will probably trigger memories of that friend. If you got sick the last time you ate a hot dog, you will likely feel nauseous the next time you see one. Learning through association is a common part of our lives. Before we can proceed much further in our understanding of classical conditioning, we need to learn some new terminology. Although a bit awkward and confusing at first, these new terms will allow us to expand our discussion of classical conditioning to topics more relevant to your own experiences than salivating dogs without losing sight of the basic concept. First we use each of these four new terms to refer to the specific stimuli and responses in Pavlov’s experiments, then we use them with new examples. The new terms are as follows. 1. Unconditioned Stimulus – The meat which was given to the dogs in Pavlov’s experiments was the unconditioned stimulus (UCS). This can be any stimulus that can elicit the response without any learning. In other words, the response to an unconditioned stimulus is natural and inborn. 2. Unconditioned Response – The dogs’ salivation to the meat powder was the unconditioned response (UCR). It is an unlearned, inborn reaction to the unconditioned stimulus. 3. Conditioned Stimulus – The bell used in Pavlov’s experiments was originally unable to elicit the response of salivation, but it acquired the ability to elicit the response through the process of classical conditioning. It was the conditioned stimulus (CS) in Pavlov’s studies. 4. Conditioned Response – When the dog began salivating to the conditioned stimulus, salivation became the conditioned response (CR). When a response that is similar or identical to the unconditioned response is then elicited by the conditioned stimulus, it’s referred to as the conditioned response. To summarize: The meat was the unconditioned stimulus (UCS); the bell was the conditioned stimulus (CS), the salivation was the unconditioned response (UCR); and when the salivation was elicited by the conditioned stimulus, it became the conditioned response (CR). We have finally covered enough terminology to be able to give a precise definition of classical conditioning. Classical conditioning is a form of learning in which a previously neutral stimulus (CS) is paired with a stimulus (UCS) that elicits an unlearned response (UCR). As a result of these pairings of the CS and the UCS, the CS comes to elicit a response (CR) that is identical or very similar to the UCR. Note that we consider classical conditioning to be a form of learning not because a new behaviour has been acquired, but because an old behaviour can be elicited by a new stimulus; behaviour is ―changed‖ only in that sense. It is important to notice also that the process of classical conditioning does not depend on the behaviour of the individual being conditioned. The critical element in classical conditioning is that the CS and the UCS be closely associated in time. A problem that affects many children is nocturnal enuresis, or nighttime bed-wetting. Some children do not develop the ability to wake up during the night when they have a full bladder, long after most children have learned to do so; instead, they wet the bed in their sleep. About 1 percent of all 5-year-olds and 2 percent of children over 12 have this problem, especially boys. While this is not a problem of major concern, it’s embarrassing for the child and often quite upsetting for the parents. A simple device, called the bell and pad, was developed many years ago based on the principle of classical conditioning that deals with the problem of nocturnal enuresis rather successfully. The device consists of two thin metallic sheets that are perforated with small holes and attached separately by wires to a battery-operated alarm. The flexible metallic sheets are placed on top of one another and separated by a sheet of fabric and then laid under the child’s sheets. As soon as the child passes the first drops of urine, the urine closes the electric circuit between the metallic sheets, causing the alarm to wake the child. In the terminology of classical conditioning, the alarm is a UCS that elicits the UCR of awaking. By repeatedly pairing the alarm with the sensation of a full bladder, these sensations become a CS that elicits the CR of awakening. This process of classical conditioning—which does not hurt, but is not appropriate for the bed training of normal children—has be found to been over 60 percent successful in treating nocturnal enuresis. In 1920, behaviourist John B. Watson and his associate Rosalie Rayner published what must be the most widely cited example of classical conditioning and stimulus generalization in psychology. Watson was convinced that many of our fears are acquired through classical conditioning and sought to test this idea by teaching a fear to a young child, the now famous little Albert. Albert was first allowed to play with a white laboratory rat to find out if he was afraid of rats. At that time they discovered that he was not. Then as he played with the white rat, an iron bar was struck loudly with a hammer behind Albert’s head. As might be expected, the noises caused Albert to cry fearfully. After seven such pairings, Albert showed a strong fear response when the rat was placed near him. He had learned to fear the rat through classical conditioning. In addition, the fear seemed to have generalized to other similar objects. Five days later, Albert reacted fearfully to a white rabbit, a dog, and a sealskin coat. He also showed mild fearful reactions to balls of cotton and a Santa Claus mask. For understandable reasons, this experiment would not be considered ethical by today’s standards. Although the conditioned fear probably did not persist, Watson and Rayner made no attempt to reverse the conditioning of Albert’s fear, and they possibly left him with a minor phobia for the rest of his life.